Re: Pandemrix vaccine: why was the public not told of early warning signs? From an article just published we are advised that………. It is clear that the EudraVigilence database was undoubtedly relied upon for signal detection purposes in respect of Pandemrix. Over and over the EMA website has been highlighted as the means by which information in respect of Pandemrix was placed in the public domain. The authors recognised the consequences in failing to include consumer ADR’s in an overall assessment of product safety. The article includes feedback from a number of countries on the role of consumer reporting with Austrailia pointing out that “Consumer reports provide a valuable addition to the data available for the monitoring of medicines safety, and should be encouraged”. On 6th July 2009 the MHRA circulated a “Dear Colleague” letter advising of a new “Swine flu ADR Portal” to be used by professionals and public alike to report adverse reactions to either antiviral medications or the swine flu vaccines. With the article by Florence van Hunsel et al in mind, one has to wonder if the reports submitted by the public to the Portal were forwarded for inclusion in either the WHO or EudraVigilence databases. Was it the case that only the HCP adverse reaction reports were submitted, and if so, why? If patient reporting at that time wasn’t routinely shared by the UK, what reassurance is there that the many reports completed and submitted by affected members of the public in connection with a swine flu product, were included in the overall EMA assessment as to product safety? If consumer reporting wasn’t included from the UK and Sweden (two countries which went on to have a significant problem with narcolepsy) how might that have contributed to the fact that in September 2010 there was insufficient evidence of a link between the vaccine and reports of narcolepsy?. Setting aside the pandemic, one is left wondering why, if patient reporting (in respect of any product) was formally included in the UK Yellow Card Scheme from 18th February 2008 onwards (following a pilot study commenced in 2005), these reports were not being shared by the MHRA with the EudraVigilence database, particularly since a significant proportion may have had EU product licences. Conversely, if it was the case that the MHRA didn’t share patient reports of adverse reactions, why did the EMA and the WHO tolerate that, and not insist on consumer reports also? The fact that patient reporting provides a valuable contribution is very well documented. Consumers may contribute different aspects of ADR reporting to that provided by HCP’s alone. Clarification by the MHRA as to whether or not patient Yellow Card reports in respect of swine flu vaccines were forwarded to the WHO and EudraVigilence databases along with HCP reports, would be welcome. Peter Aitken  raises some interesting issues. It might also be the case that if governments and health officials are unwilling to share with the public the basis of their decision making then they are making the wrong decisions. Peter Aitken writes with passion and sincerity about the importance of influenza vaccines, but I believe he has been misled, along with the majority of the population in the UK and US, by massive and recurrent publicity campaigns. It may seem hard to believe, but repeated pronouncements of “…60% vaccine effectiveness…40% vaccine effectiveness…20% vaccine effectiveness…” are based on biased and quite limited research and do not constitute proof that influenza vaccines have done more good than harm in recent decades. The scattergun US campaign for annual flu shots may be relevant to US cases of acute flaccid myelitis/AFM. There have been 362 cases reported in the US since August 2014, mainly in schoolchildren and occurring mainly in the autumn. (CDC, AFM Investigation 10/5/18) Intramuscular injections are known risk factors for paralytic polio when polioviruses, wild or vaccine-associated, are in circulation. (Mawdsley, Lancet 2014;384:300) The same is likely to be true for non-polio neurotropic enteroviruses such as EV-D68 and EV-A71. US public health authorities have been reluctant to investigate this possibility, but it should not be dismissed, particularly since evidence that flu shots are lifesavers is lacking. Doctor Aitken’s heart is in the right place, but he gives influenza vaccines credit they don’t deserve. Dr Aitken criticises the BMJ for publishing the article, THIS WEEK OF ALL WEEKS. But, The BMJ is read the world over, this week and every week. The BMJ cannot observe silence every week. I had decided to forego flu vaccine this year - as I have done every year. I am aged 86. And, I am NOT an anti-vaccine person. Have had numerous vaccinations and vaccinated my wife and children too a couple of times. But smallpox is one thing. Influenza is a different matter altogether. Drug company and data stories are news, transparency and confidence in commercial data is important but 2009 is some time ago, in a context when there was a genuine concern in regard to "swine ‘flu pandemic" and a regulatory process that was adjusted by agreement with governments to bring vaccines quickly to the population lest we have a repeat of mortality on the scale of 1918/19. The BMJ has previously reported on Pandremix in 2013 (1) so why is this news now? Vaccine scare stories are also news and are known to impact adversely on uptake. You cite Wakefield MMR but as Goldacre (2) argued in 2008, the media may have responsibility to bear in the way they report. I like many senior medical leaders am asked by the NHS (3) to lead by example, be vaccinated, and ask all our staff to follow suit. We are asked to protect ourselves (4) and the patients we serve by reducing sickness absence and risk of transmission of circulating ‘flu. Why when NHS trusts are working hard to protect their staff and the public from influenza, launching our annual 'flu jab' campaigns, would the BMJ pick this of all weeks to run this story? How did the Editorial board come to the conclusion that it was in the public interest to run with this story at such a sensitive time for the NHS ‘flu vaccination program? For the UK's leading medical publication and important contributor to medical continuing professional development to have a lead Editorial and two pages 14/15 on the concern and only 1/2 page on the industry response on p28 I suggest leaves the casual reader in no doubt that there is an issue to be resolved and that can be enough to turn medical people away from supporting vaccination. What will the lay press make of the BMJ lead here? Is there a genuine concern about the transparency of data around this year’s vaccines and real concerns about their safety? Should we as senior clinicians be offering a more cautious advice to our NHS trust boards? If there is a concern about this years’ ‘flu vaccines safety based on a lack of openness and transparency around commercial data please state it clearly. If not then I think the articles are ill-timed as they are likely to weaken confidence in the current NHS Public Health England ‘flu vaccination program whilst the important issues of data access and transparency are partially obscured and could be addressed separately without risking harm. (1) Miller E, Andrews N, Stellitano L, et al. Risk of narcolepsy in children and young people receiving AS03 adjuvanted pandemic A/H1N1 2009 influenza vaccine: retrospective analysis. BMJ 2013;346: f794. Tom Jefferson says "As Healy pointed out, openness and clarity are the enemies of vaccine hesitancy. Non response and obfuscation are gifts to those who are ideologically opposed to vaccines and their use." Jefferson's bald reference to those "who are ideologically opposed to vaccines and their use", discounts the legitimate concerns of citizens who are alarmed at rapidly increasing vaccination schedules and the arguable over-use of vaccine products. Vaccine products are added without any consultation with the community, and are even being mandated by governments in countries such as Australia, the United States and Italy. It’s astonishing that the move towards mandating the medical intervention of vaccination, and the deleterious impact on the right to 'informed consent', has had such little critical analysis. Associate Professor in International Criminology Paddy Rawlinson is one of the few academics to tackle this subject, in her essay Immunity and Impunity: Corruption in the State-Pharma Nexus. It’s extremely difficult for citizens to gain accountability for vaccination policy, with politicians and vaccination bureaucrats blatantly ignoring citizens' concerns on this matter. It’s also difficult to raise this issue on public forums, where the threat of censorship hovers constantly, and where people hiding behind pseudonyms often try and sabotage debate on mainstream media platforms. Elizabeth Hart's report about Markku Partinen's experience with the Lancet and NEJM is very similar to the experience of Danuta Skowronski and her Canadian colleagues when they submitted their report of an increased risk of illness from pH1N1 infections among prior recipients of the seasonal flu shot. After much delay they eventually got it published. (Skowronski et al, PLoS Med 2010;7(4):e1000258) Notably, US public health authorities--the CDC, etc--never publicly acknowledged their report. May I point to just the last sentence of the text of Jefferson’s response? I totally agree. 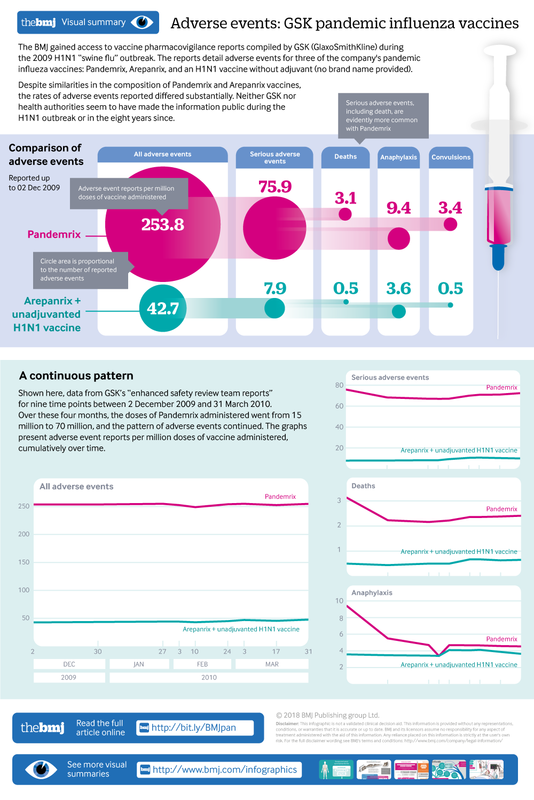 Those who have followed the responses on matters relating to vaccination (immunisation) in the bmj, will have noticed that never have the public health specialists in England responded to questions, doubts, queries in the bmj. Some of us, who served in Public Health when the public health doctors were answerable to the local population and were interrogated by the councillors (in open meetings) and by the press, radio and television, never wore a veil, never played deaf nor dumb. Vaccines: who are the ideologues and who are the realists? "As Healy pointed out, openness and clarity are the enemies of vaccine hesitancy. Non response and obfuscation are gifts to those who are ideologically opposed to vaccines and their use." Leaving David Healy aside, who may not wish to say any more than he has already said, without "openness and clarity" there is no informed consent, and if people knew more they might possibly be more willing, or they might be less, but I am also not happy with any label which might be hung on me or many others who may just want medical science to be properly grounded. It seems to me more likely that if we have a belief system (aggressively defended) in favour of the extending vaccine schedule without adequate data (and with potentially great commercial advantage) that in itself constitutes an ideology, much more so than people being sceptical of failing or biased systems, who may also have have witnessed harms that are seldom if ever officially acknowledged. Nor, sadly, do I know after 15 years of surveying the field of any vaccine which is adequately tested or monitored, Pandemrix being only one example. Given the pervasive systems failures which Jefferson and Doshi have also recently been highlighting with HPV vaccines, the public have a right to be careful, hesitant and even anti until public health gets its house in order. Arlett’s statement, “Pandemrix was developed for use specifically in a flu pandemic. It was authorised in the European Union (EU) on 29 September 2009 to immunise citizens against the H1N1 pandemic influenza strain. Information from clinical trials in more than 6,000 subjects was assessed as part of an extensive review of the vaccine’s safety profile before its authorisation, and the outcome of the assessment is available on the EMA website” plays on the average reader’s inability to check facts. The Pandemrix vaccine referred to by Arlett contained the influenza antigen H5N1 and GSK’s proprietary adjuvant system AS03, as well as stabilisers and preservatives (1, 2, 3). However, the product Pandemrix which went on the market contained AS03 as well as broadly similar quantities and concentrations but the influenza antigens were different: H1N1. This is because in the decade preceding the 2009 epidemic a regulatory process to develop and pre-licence so called mock up vaccines was put in place with the sole purpose of speeding up registration in an emergency. Once the mock-up had received registration (in this case the H5N1 containing vaccine), licensing of the real pandemic vaccine (in this case Pandemrix) was cut down to five days (4). At the time of provisional licensing (29 September 2009) no data were available for Pandemrix (containing H1N1 and AS03). The whole pandemic licensing programme at the time of vaccine roll out was based on analogy of the properties of one mock up vaccine compared to the pandemic vaccine which was subsequently used (4). The clinical trials of Pandemrix were only just starting at the end of September 2009. As Healy pointed out, openness and clarity are the enemies of vaccine hesitancy. Non response and obfuscation are gifts to those who are ideologically opposed to vaccines and their use. 3. GlaxoSmithKline. AS03 Adjuvanted H5N1 Vaccine (for pandemic use). Common Technical Document (CTD). Module 2 Section 2.6. Non clinical written and tabulated summary. Available from: http://www.mhlw.go.jp/shingi/2010/01/dl/s0115-7l.pdf Overview. Competing interests: TJ was a recipient of a UK National Institute for Health Research grant for a Cochrane review of neuraminidase inhibitors for influenza. In addition, TJ receives royalties from his books published by Il Pensiero Scientifico Editore, Rome and Blackwells. TJ is occasionally interviewed by market research companies about phase I or II pharmaceutical products. In 2011-13, TJ acted as an expert witness in litigation related to the antiviral oseltamivir, in two litigation cases on potential vaccine-related damage including Pandemrix (2015-2017) and in a labour case on influenza vaccines in healthcare workers in Canada. He has acted as a consultant for Roche (1997-99), GSK (2001-2), Sanofi-Synthelabo (2003), and IMS Health (2013).In 2014 he was retained as a scientific adviser to a legal team acting on oseltamivir. TJ has a potential financial conflict of interest in the drug oseltamivir. In 2014-16, TJ was a member of three advisory boards for Boerhinger Ingelheim. TJ was holder of a Cochrane Methods Innovations Fund grant to develop guidance on the use of regulatory data in Cochrane reviews. TJ was a member of an independent data monitoring committee for a Sanofi Pasteur clinical trial on an influenza vaccine. Between 1994 and 2013, TJ was the coordinator of the Cochrane Vaccines Field. TJ was a co-signatory of the Nordic Cochrane Centre Complaint to the European Medicines Agency (EMA) over maladministration at the EMA in relation to the investigation of alleged harms of HPV vaccines and consequent complaints to the European Ombudsman. TJ is co-holder of a John and Laura Arnold Foundation grant for development of a RIAT support centre (2017-2020) and Jean Monnet Network Grant, 2017-2020 for The Jean Monnet Health Law and Policy Network. TJ is an unpaid collaborator to the project Beyond Transparency in Pharmaceutical Research and Regulation led by Dalhousie University and funded by the Canadian Institutes of Health Research (2018-2022).